family has effective door reinforcement which is the key to your security. from home invasion and burglary. successful break in's they will move on and look for easy entry. can now be secured ten fold by adding the new Armor Conept Security Solution to your front door system. Double doors are the most difficult door entrance to secure because there is no jamb to aid in door reinforcment. 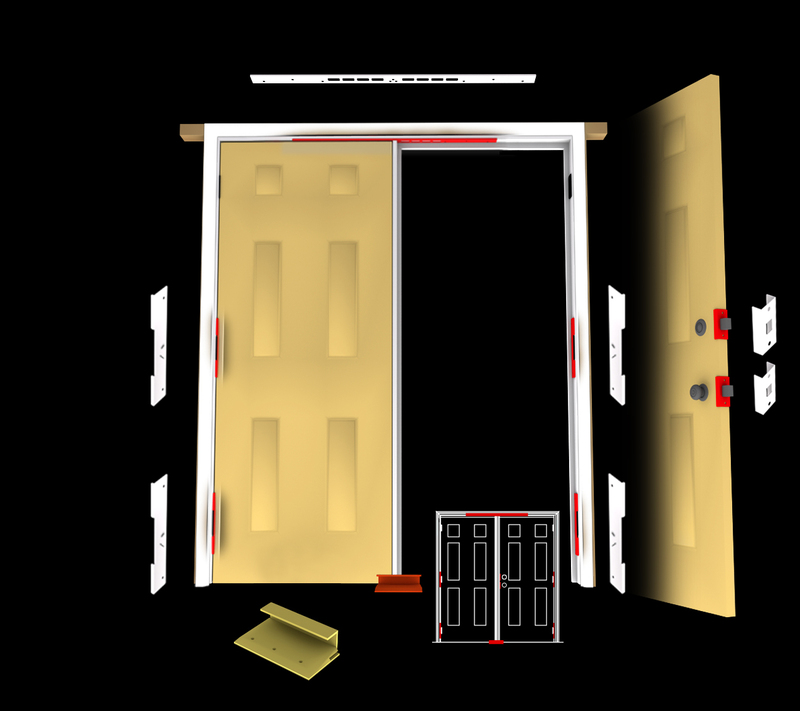 Our double door Armor Concept products focusses on reinforcing the top and bottom of the door frame by offering ultra strong door shields and a nightlock, available in brass and nickel that insures the door will still be there when you attack it. As with other solutions, these products provide total door security and also include door reinforcement solutions for hinges and door locks which will provide additional protection when we also install high security products like Medeco & Mul-T-Lock high security deadbolt hardware. Peace of mind is important to our custmers, knowing your family will feel safe is the most important factors in selecting any security product. Security safety is one of the top 5 reasons that people acutally move from one property to another. While home owners are almost always concerned about their safety and security, the honest truth is that multi-family security is not a high priority to many property owners, unless it is a problem. Our goal at Pre-Lock Security is to review your exterior doors and check all the hardware you currently have in place. We will point out the problems and make sure you understand what we need to do to make your home a safe place. Pre-Lock Security Services is an authorized Armor Conept installation dealer.